Two-time heavyweight boxing champion who compiled 76 wins, 68 by knockout, during his legendary career. 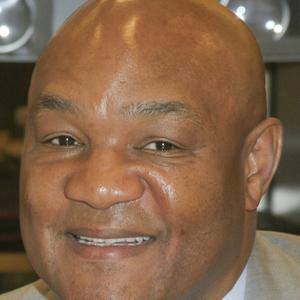 He won a gold medal in the heavyweight event at the 1968 Olympics in Mexico City. He dropped out of high school when he was 15 years old before finding some stability in his life through Job Corps. His first professional fight came in 1969. In 1994, he became the spokesman for a popular line of cooking grills that shared his name, an enterprise estimated to have netted him nearly a quarter of a billion dollars. He has twelve children, and each of his five sons is named George. None of his first four marriages, to Adrienne Calhoun, Cynthia Lewis, Sharon Goodson and Andrea Skeete, lasted more than four years. In 1985, he married Mary Joan Martelly. He was defeated by the legendary Muhammad Ali in the famous Rumble in the Jungle fight in 1974.